Happy 2017. May your travels in the coming year be frequent and rewarding. The Naples Beach Hotel & Golf Club, in Southwest Florida, had its golf course redesigned with input from Jack Nicklaus, in collaboration with course architect John Sanford of Sanford Golf Design. This $9 million project follows $50 million in renovations and enhancements at the resort over the last few years. You can experience the resort and the new course with the “Golf by the Gulf” package. Available through Apr. 30, 2017, the package is available for one golfer, two golfers, or for one golfer and one non-golfer. The package includes: greens fees on the redesigned golf course, cart rental, bag storage, range balls, and golf gratuities. A two-night minimum stay is required, and the cart rental is shared for the “two golfers” package. The “one golfer and one non-golfer” package includes a 50-minute massage at the resort’s spa for the non-golfer. The resort offers no resort fees, free valet parking and self-parking, and free access to the resort’s fitness center. The “one golfer” package starts at $399 per night. The “two golfers” package starts at $553 per night. The “one golfer and one non-golfer” package starts at $555 per night. Packages are based on availability, and blackout dates may apply. The package may not be combined with any other offer, and is not applicable to groups. Set on 125 acres with seven miles of beach, the resort is Southwest Florida’s only resort directly on the beach with an on-site golf course, a spa, and tennis center. Naples Beach Hotel & Golf Club Golf by the Gulf Package or 800/237-7600. Thirty years ago, Scenic was born as a way to improve the occupancy of an out-of-the-way hotel on Australia’s southern coast. Glen Moroney created marketing materials and visited retirement communities to promote bus tours. Within a year, the property was full and Moroney began to create memorable trips with exceptional service. Today, the company escorts more than 500 land and water itineraries in 66 countries. To express their appreciation, Scenic wants to share in the celebration with anniversary river cruise promotions. These offers are for U.S. residents on new bookings and are not combineable. These offers are good while supplies last. Three free nights in Prague on the eight-day Nuremburg to Budapest cruise itinerary. The Scenic Space Ships offer private butler service and unlimited free beverages and spirits including mini-bar re-stocked daily, full-size balcony staterooms where the walkout open-air balcony converts to an all-weather lounge. On board cuisine allows for up to six dining options. You don’t need to reach for your wallet as everything (except a haircut or massage) is included: tips and gratuities, local guides, Scenic Freechoice activities, and Enrich events exclusive to Scenic. Scenic offers a River Cruising Travel Guarantee at no charge. Scenic covers any delays or cancellations due to weather, natural disasters, mechanical breakdowns or labor strikes. Coverage will include high/low water issues that plague the industry. If approved, you will receive direct monetary refunds, up to $750 per day with a maximum of seven days or $5,250 per guest, instead of future cruise credits. The Islands of Tahiti, 118 islands and atolls known for their lagoons and sand beaches, allow you to experience the Tahitian way-of-life by staying in a family-operated Tahitian pensions (pone-see-owns) – ranging from bed and breakfasts to guesthouses and boutique lodges. Pensions offer an experience through traditional and modern Tahitian life. These Polynesian family-run accommodations are classified and benchmarked to guarantee standards of comfort and quality. Pensions range from stand-alone bungalows and villas, often called lodges, to furnished rooms within a Tahitian family home. A stay at a pension offers an experience into how Tahitians live – from locally sourced meals and activities. Stories of history, tradition and legend may be shared and exchanged over meals, bringing Tahitian culture and Mana to life. Mana is what Polynesians refer to as the life force and spirit that connects all living things. Tahiti Tourisme's pension promotion features five packages by Tahiti Nui Travel which include international air, inter-island transportation and most meals. All taxes and service charges included except the communal tax of $3 per person, per day. Many of Bonaire's hotels offer packages with deals that provide savings. Here are a few of the packages and deals. Belmar Oceanfront Apartments, 888/655-0605, Book six months in advance for the Early Bird Special and receive a 10 percent early bird discount. The discount applies to net rates and cannot be canceled or rebooked; must be paid in full when booking; and is not valid with other specials or promotions. The discount is valid for travel all year except Aug. 5 to 18, Nov. 18 to 24, 2017 and Dec. 23, 2017 to Jan. 5, 2018. Captain Don's Habitat, 800/327-6709, The 6 Boat Dive package includes seven nights' ocean view room accommodations, welcome rum punch, free Wi-Fi, manager's reception with live entertainment, six single tank boat dives, six days of 24 hour unlimited shore diving and all government taxes and service charges. Rates from $1,008 per person, based on double occupancy, and valid for travel to Mar. 31, 2017. Den Laman Condominium, 800/382-1094, The Drive & Dive package includes studio, one or two bedroom condominiums accommodations; free Wi-Fi, daily breakfast buffet, seven days rental vehicle, six days of unlimited shore diving (plus options to add on boat dives), free upgrade to Nitrox, manager's rum punch party and all government taxes. Rates from $977 per person, based on double occupancy in an island view studio to $1,309 in an ocean front one bedroom. The package is valid for travel to Apr. 21, 2017. Divi Flamingo Beach Resort & Casino, 800/367-3484, Their Two Tank Boat Dive Winter promotion package includes seven nights' stay, daily breakfast, 11 boat dives, unlimited shore diving, welcome drink, roundtrip airport transfers and free Wi-Fi. Rates from $1,042 per person based on double occupancy. Valid for travel Jan. 1 to 13, and Mar. 1 to Apr. 16, 2017. Happy Holiday Homes Bonaire Bliss, 599/796-5530, includes accommodations in an equipped apartment with kitchen near Atlantis Beach, free Wi-Fi and a rental vehicle. Rates from $503 per person, based on double occupancy for a seven night stay. Valid for travel Jan. 7 through Apr. 15, 2017. Sand Dollar Condominiums Bonaire, 800/288-4773, offer their Ride to the Reef package with PADI 5 star Dive Friends Bonaire. Packages include studio, one, two or three bedroom condominium accommodations, free Wi-Fi, seven days rental vehicle, six days of unlimited shore diving, free Nitrox and all government taxes. Breakfast buffet may be added. Rates from $698 per person, based on six people sharing a three bedroom condo and a nine person van. Valid for travel through Apr. 21, 2017. During Helsinki Sauna Day, in Helsinki, Finland, more than 50 saunas throughout the Finnish capital open their doors free of charge. This year held on Mar. 11, 2017, Sauna Day includes saunas in private homes, residential saunas in apartment buildings, hotel saunas, tent saunas, trailer saunas, one sauna inside a van and a floating sauna. Helsinki’s newest public saunas Löyly and Allas Sea Pool also take part, and people enjoy and participate in “sauna marathons” by hopping from sauna to sauna throughout the day. Helsinki Sauna Day originated in Helsinki. Now saunas throughout Finland are starting to take part. In 2017, saunas from the neighboring cities of Espoo and Vantaa are taking part. The Helsinki Sauna Day website, make sure you click on the English version, gives you information about sauna tips for beginners and sauna facts. The Gilmore Car Museum near Kalamazoo, MI offers a driving experience like no other. Imagine yourself behind the wheel of a car without a gas pedal, fuel gauge or speedometer. No, it’s not a self-driving auto or the newest model Tesla electric vehicle. For this special experience you are put behind the wheel of an authentic Model T Ford out of the Museum’s collection and you drive them within the museum campus. The Model T is controlled by three pedals on the floor, a handle beside the seat and two small levers on the steering wheel. The only fuel gauge was a wooden ruler you’d place into the gas tank, most often located under the driver’s seat. A speedometer was an option and a hand operated windshield wiper wasn’t standard until 1925. Oh, don’t forget the crank out front for starting the engine. The Gilmore Car Museum, North America’s largest auto museum, has offered Model T driving courses to the public throughout the summer for nearly a decade and each of the dates sell out quickly. In response, several additional classes have been added bringing the total to 22 sessions for the 2017 season. While the Model Ts may appear simplistic by today’s standards, they hold a challenge for drivers of modern cars. The “Old School” driver’s training takes about four hours and each session is taught by long-time Model T owners and enthusiasts and includes practice driving in genuine Model T Fords around the Museum’s three miles of paved roadway. Museum historians provide a bit of history on Henry Ford, the early Ford Motor Company, and up close inspections of various Model Ts during the course’s special guided tours. This is a rare opportunity to interact with these authentic vehicles, normally only seen on static display by actually sitting behind the wheel and driving one. Participants can sign up online to attend one of the 22 classes offered or call the museum with questions. The cost of this “old school” driver’s training is $105 per student or $95 per student for Museum members and is open to any licensed drivers 16 years or older. After successfully completing a road test in a Ford Model T, each student is presented with a Certificate of Completion and souvenir booklet. Class size is limited. Gilmore Car Museum or 269/671-5089. Airbnb moves beyond accommodation with Trips. Bringing together where you stay, what you do and the people you meet all in one place. Trips launches with three key areas - Experiences, Places and Homes. Flights and Services will be added in the future. Trips will immerse you in communities where you can have access to local passions and interests, such as violin making in Paris or marathon running in Kenya. Discover what locals know via personal recommendations and socialize with other travelers and locals at events. Experiences are designed and led by local experts and offer access and insights into places that you wouldn't otherwise come across, such as truffle hunting in Tuscany or the grime music scene in London. Trips launches with around 500 Experiences in 12 cities worldwide and will expand to 39 cities. Hosts can request to list their Experience. Trips bring places to life through the people that live there. A number of Experiences will also be available where you can give something back to communities through non-profit organizations. In Detroit, go behind-the-scenes with Khali Sweeney at his Downtime Boxing Gym that provides children with an after-school program of healthy snacks, homework time, and boxing lessons. With Insider Guidebooks, Airbnb identifies cultural experts and neighborhood insiders to recommend the hidden gems within their city. 100 Insider Guidebooks will be available at launch in six cities - Los Angeles, San Francisco, Havana, Nairobi, Detroit and Seoul. Places includes more than one million recommendations from Airbnb's home hosts, recommending their favorites in their neighborhoods. A partnership with restaurant booking platform, Resy, will make it possible to book tables at local restaurants through the Airbnb app. Airbnb has a partnership with Detour to offer audio walking tours allowing you to discover neighborhoods in a unique and authentic way. Audio tours will initially be available for Los Angeles with San Francisco, Paris, London, Tokyo and Seoul to follow in Spring 2017. With Trips, Airbnb wants to make travel more social, helping connect the Airbnb users in a city on any given night. Meet ups within Places will let local businesses host events for Airbnb guests and locals to connect with each other. The launch of Trips also introduces a new identity authentication process that the Airbnb Experiences Community will be using. Hosts and guests will scan an official government ID (a passport, or driving license) and then take a selfie. After the ID is authenticated, the ID and selfie will be reviewed to confirm that both pictures appear to match. This new identity authentication is required for all Experiences users, and is being tested for homes bookings. Trips leverages Airbnb's existing Trust & Safety measures including a global 24/7 support team, secure payments, messaging, profiles & reviews, and a $1 million liability insurance program for eligible Experience hosts. The American Red Cross is urging you to stay safe by offering travel tips. Air, Train Travel - Winter is flu season. If someone has been sick or been in contact with someone who is sick, consider postponing your trip. They could be contagious for a week before symptoms appear. Go Ahead Tours offers a discount on one departure of its 11 day Italy and Greece tour. The trip, which includes 18 to 35 travelers, makes its way through Italy and Greece’s most iconic cities. The Mar. 15, 2017, tour is discounted to $1,799 per person, based on double occupancy from $2,149. Flights are not included. The tour starts in Sorrento and a sail to the Isle of Capri. You continue to Rome, stopping to explore the ruins of Pompeii. After landing and touring in Athens, travel to Nauplia. You can extend your stay three nights by adding Santorini and Athens from $799 per person. This extension is not available on all departure dates. The tour pace is walking about two hours across moderately uneven terrain, including paved and unpaved roads with some hills and stairs. Go Ahead Tours or 800/590-1170. Celebrate the start of our National Park’s second century by visiting a park in 2017. During 10 days of the year, all National Park Service sites that charge an entrance fee will offer free admission to everyone. There are more than 400 parks available to everyone, every day. The fee-free days provide a great opportunity to visit a new place or an old favorite, especially one of the 124 national parks that normally charge an entrance fee. The others are free all of the time. Ski.com give you 20 percent savings on lodging at Moonlight Basin, MT, during ski season when you stay three or more nights. The offer runs through Apr. 23, 2017 and you must book by Apr. 23, 2017. You can get the third night free in Crested Butte, CO when you book two nights of lodging and two days of skiing. You receive the third night and third day free during Mar. 17 to 31, 2017. Lift tickets must be packaged with valid Crested Butte Mountain resort lodging to receive third-day-free discount. This promotion may not be combined with any other offers. Ski.com Moonlight Basin or 800/784-5158. ski.com Crested Butte or 800/784-5158. Ylläksen Yöpuu, in Ylläs, Finland, offers a Northern Lights guarantee. When you stay for a week in Ylläksen Yöpuu, the Northern Lights will appear. If there are no sightings of Northern Lights during your week, you will have half of the cost of your accommodations returned. The Northern Lights guarantee is valid throughout January. "We have claimed for many years that the Ylläs area is one of the best Aurora-tourism destinations in the Nordic countries, and now is the time to deliver a product which shows that we stand firmly by this" explains Vesa Kaulanen, Ylläksen Yöpuu entrepreneur. According to Kaulanen, in the Ylläs area there is around a 60 to 70 percent chance of seeing the Northern Lights whenever the weather is clear. Since 2012, the village street lights are turned off each evening at the best times to see Northern Lights. Twilight runs to Feb. 19, 2017. During this period, the street lights are switched off every night from 10 p.m. to 6 a.m.
Ylläs also offers Finland's largest ski resort, an extensive cross-country ski trail network and winter biking and snowshoeing. In Ylläs you will find the genuine Lapland in traditional villages, but with modern services. Finnair, Lufthansa, Germania and Monarch offer seasonal scheduled flights to Kittilä Airport, a 40 minute drive from Ylläs. Stay free at Williamsburg Lodge and Williamsburg Woodlands. A minimum two-night stay is required. Play golf and tennis free. You also receive length-of-stay admission tickets to the Revolutionary City and Art Museums of Colonial Williamsburg. Tickets are valid for your length of stay concurrent with the dates of reservation and limited to the number of guests staying in the room. Eat free with breakfast at your hotel and dinner from the children’s menu at Huzzah’s Eatery, Sweet Tea & Barley and Historic Taverns. Rates are from $89 per person, based on double occupancy. The offer is good on a two-night minimum stay through Mar. 31, 2017. Colonial Williamsburg Kids Stay, Play and Eat Free or 888/965-7254. Hotel packages at the Airds Hotel and Restaurant, in the Scottish Highlands, offer luxury for less with themed and seasonal hotel packages for 2017 from $151. A member of Connoisseurs Scotland, the hotel offers eight standard rooms and three suites and fine dining. 2017 customized packages range from winter escapes to romantic getaways. Rates are based on a December 2016 currency exchange. Through Mar. 31, 2017, the two- or three-night Winter Getaway includes accommodations, daily five-course dinner with coffee and petit fours and Scottish breakfast. Reduced rates start at £122 (about $151) per person, per night, based on double occupancy. Airds’ Valentine’s Weekend Break, Feb. 10 to 15, 2017, includes accommodations, a bottle of champagne on arrival, candlelit dinner each evening and daily breakfast. Rates are from $379 per night, based on two guests per room. The three-night Easter package, Apr. 14 to 17, 2017, includes accommodations, daily five-course dinner, daily breakfast, a bottle of champagne on arrival, cream tea (tea with scones, clotted cream and jam) and a homemade Easter egg. Rates are from $206 per person, per night, based on double occupancy. Available in 2017, Gourmet Breaks culinary package includes accommodation, champagne and homemade chocolates on arrival, and two dinners - a Chef’s Choice tasting menu with wine pairings and a personalized tasting menu. Rates begin at $1,056 for the two-night package, based on two guests sharing. Airds’ location, with little light pollution, makes for excellent star-gazing. The star-gazing weekend Mar. 24 to 26, 2017 includes night-sky walks and talks with Mike Alexander from the Galloway Astronomy Centre, dinners (including a five-course offering), breakfasts, champagne, and answers to astronomy questions. Rates start at $1,027 for the two-night package, based on two guests sharing. Originally an 18th-century ferry inn, the hotel overlooks Loch Linnhe and the Morvern Mountains on the west coast of Scotland, in the hamlet of Port Appin. This location provides access to Oban Whisky Distillery, ferries to Skye and the Island of Mull, driving tours and Glencoe National Park. Blue skies and the deep snow pack says spring in Utah. From ski-in/ski-out lodging and lift ticket offers, to ski and snowboard rentals, here are some Utah spring ski deals. Ski free at the Chateaux Deer Valley in Park City – Their Classic Ski package starts at $459 a night and is valid to April 2017. The rate is subject to change based on room category. Two adults stay in a hotel room or studio accommodations and receive daily breakfast buffet and adult lift tickets to Deer Valley Resort. Additional lift passes and rentals may be arranged when booking. Deer Valley Resort is a ski-only resort in Park City. A two-night minimum stay is required and lift tickets are non-refundable, non-transferable multi-day passes. The offer is subject to availability. It may not be combined with any other promotion and is not available to groups. Solitude Resort Lodging, 800/748-4754, offers accommodations packages in the Solitude Mountain Resort base area. Book three nights of lodging and lift tickets and the fourth night lodging and fourth day of lift tickets is free. The package is valid to Apr. 16, 2017, excluding Feb. 16 to 21, 2017, and Mar. 10 to 25, 2017. With the Spring Lodging Deal, receive 15 percent savings on lodging managed by Solitude Resort Lodging. The package is valid Mar. 10 to 25, 2017. A minimum night stay is required and varies by property and date. The Late Season Ski and Stay package offers 20 percent savings on ski/snowboard rentals and lodging at accommodations managed by Solitude Resort Lodging. The package is valid Mar. 26 to Apr. 16, 2017. A minimum night stay is required and varies by property and date. Park City Resort Lodging, 800/245-6417, fourth night free specials are valid to Apr. 16, 2017. During Jan. 30 to Feb.15, 2017 and Mar. 1 to 25, 2017 receive a fifth night free, except at Resort Plaza. Mar. 26 to Apr. 17, 2017, the fourth night free applies to all locations. The offer is valid at the Park Avenue condominiums, Jupiter Inn, Temptation, Crescent Ridge, Payday, Three Kings Condominiums, Park View, Lakeview, Windrift and Racquet Club Condominiums by Identity Properties. The Resort Plaza is the ski in/ski out location. Red Roof Inn wants you to take advantage of their RediCard loyalty program with free nights and the Nicest Price for stays at their hotels across the country. Red Roof's right now, right here RediCard offers rewards with free nightly stays and the Nicest Price of up to 15 percent off the best available rate or Red Hot Deals at locations across the country when you book two or more days in advance. Red Roof's Nicest Price promotion encourages you to book within days of your stay. The Red Roof loyalty program, RediCard, rewards you with a free night for only 6,000 points. Competitors require 15,000 points for a free night. Book a Nicest Price stay now. Full advance payment is required including room charge and all applicable taxes. No credits or refunds for early departures, cancellations, no shows or other reservation changes. The deal is non-commissionable and may not be combined with other offers or promotions. Red Roof has more than 470 properties in the U.S. and is expanding to Brazil, Canada, Thailand and Japan. At Red Roof 'you stay happy, pets stay free' allows one well-behaved pet per room, nationwide. February is the best time to save on admission to more than 40 participating museums throughout Seattle, WA and the region. Visit Seattle's third annual Seattle Museum Month, Feb. 1 to 28, 2017, offers hotel guests half-price admission at more than 40 participating museums throughout Seattle and the region. For visitors and locals alike, Seattle Museum Month offers an immersive way of experiencing Seattle's art, history, music, design and culture. Seattle's major museums return this year including the Seattle Art Museum, Museum of History & Industry, Museum of Flight, Museum of Pop Culture (MoPOP), Seattle Aquarium, Woodland Park Zoo, Wing Luke Museum of the Asian Pacific American Experience and the Burke Museum of Natural History and Culture. Two glass art museums are included: Chihuly Garden and Glass in Seattle and the Museum of Glass in Tacoma. The Flying Heritage Collection and the Suquamish Museum are new participants this year. You must stay in one of the participating hotels to access Seattle Museum Month offers. For qualifying visitors, the discount apply to all days participating museums are open in February, subject only to capacity. Some separate, specially ticketed exhibitions, programs and events at various participating museums are not included in Seattle Museum Month. You must present an official Seattle Museum Month guest pass at participating museums to redeem the discounts; these discounts will be valid for all guests staying in the hotel room (not to exceed four people) during hotel stay dates. The Seattle Museum Month website lists participating museums. Many offer films, lectures, tours and other special programming during Seattle Museum Month. Holland America Line's annual "View & Verandah" promotion is back. Book one of the eligible voyages by Feb. 28, 2017, and receive a stateroom upgrade; onboard spending money up to $500 per stateroom, depending on cruise length and stateroom category; and up to 10 percent off select Journeys Ashore shore excursions. In addition, book a suite and receive prepaid room gratuities. The View & Verandah offers are available on all cruises Mar. 30, 2017, through Apr. 28, 2018, excluding Grand Voyages and Grand Voyage segments. As part of the View and Verandah offer, book an ocean-view stateroom for the price of an interior and a veranda for the price of an ocean-view. Depending on the length of cruise and category of stateroom, receive on-board spending money up to $400 per stateroom and $500 per suite. The onboard spending money is available to the first and second guests in a stateroom and can be used for specialty dining, spa services, gift shop purchases and beverages. Reserve select Journeys Ashore shore excursions and receive up to 10 percent savings if booked by Mar. 15, 2017. This date is extended beyond the View and Verandah offer deadline of Feb. 28, 2017. More than 1,500 Journeys Ashore excursions are eligible for the savings. As an added bonus, suite guests receive prepaid room gratuities in addition to the onboard spending money and discount on Journeys Ashore tours. Cruise destinations featured in the View & Verandah sale include Alaska cruises and Land+Sea Journeys, Asia, Australia/New Zealand, Bermuda, Canada/New England, the Caribbean, the Panama Canal, Europe, Hawaii, Mexico, South America and Holiday sailings. In the hushed light of dusk a guide lowers a lantern, spilling low-angled light across a flat stretch of rock, casting shadows that reveal a trail of shallow dinosaur footprints so detailed it’s possible to see the exquisite texture of the ancient creatures’ skin. Stumbled upon by a pair of youngsters in 2002 while tubing down a nearby river, the trackway was the first significant find in the Northern British Columbia Rockies foothills near Tumbler Ridge. Dozens have been found since, along with a wealth of the province’s first and Western Canada’s oldest dinosaur bones, and an abundance of Triassic fish and marine reptiles. 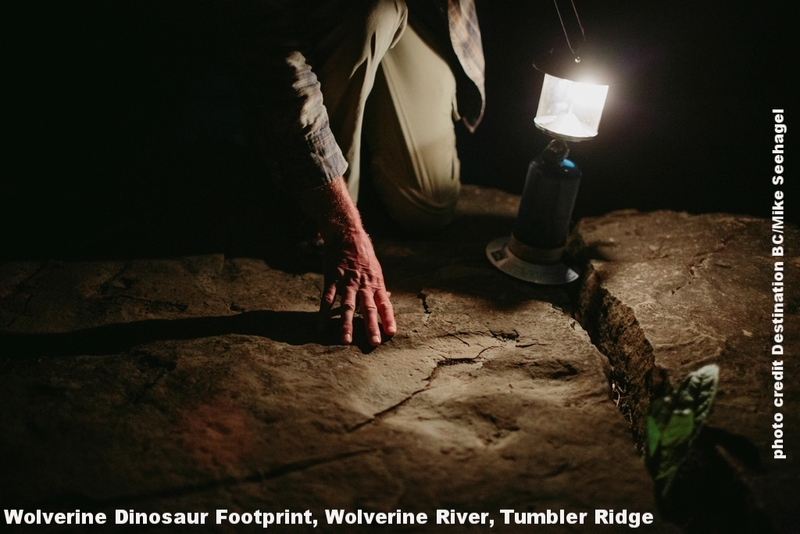 These can be seen at the Tumbler Ridge Museum’s Dinosaur Discovery Gallery, a departure point for hiking tours to the area’s two dinosaur track sites. Prompted by the boys' discovery, BC's only vertebrate paleontologists moved to town and created a research center. This convinced the small town’s physician, Charles Helm, alongside about 20 passionate locals, to promote the fossil-finds that regularly were being discovered — including a 33-foot long, 75-million-year-old duck-billed hadrosaur and as their region’s spectacular mountain landscapes with its rock formations, canyons and numerous waterfalls. Helm, his colleagues and paleontologists applied for their unique destination to be declared a UNESCO-sponsored Global Geopark, a designation that promotes geo-diversity through community-led initiatives and celebrates 4.5 billion years of Earth’s history, supporting conservation and sustainable development. 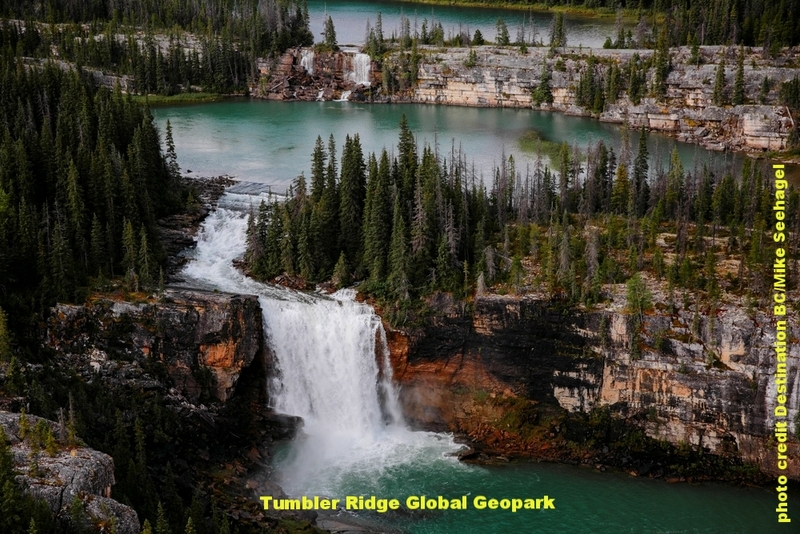 In September 2014, Tumbler Ridge became the world’s 111th Global Geopark and only the second in North America’s after Stonehammer, New Brunswick. UNESCO has long recognized British Columbia’s diverse cultural and natural treasures and Tumbler Ridge is the latest; it joins a roll call of sites across the breadth of the province. Another hotbed of Earth’s early life is an ancient seabed perched on a high mountain ridge in the Canadian Rockies’ Yoho National Park. Burgess Shale is one of the planet’s most significant fossil sites. Lace up your boots, join a Parks Canada interpreter/guide and hike to discover and hold in your hand rare 505-million-year-old fossils of often bizarre soft-bodied organisms. You can see not only the bones, shells and teeth of “stone bugs” as they were called by railway workers who discovered them in the 1880s, but also muscles, gills and digestive systems which allowed scientists an unprecedented opportunity to learn how these creatures, mostly arthropods, lived and interacted in a sea whose bed has faulted, folded and uplifted over millennia onto what is now a mountain top. Finish the trek with a fossil rubbing to take the memories home. While the Burgess Shale makes its home within Yoho National Park, it’s important to note that all of Yoho is, in fact, part of one vast UNESCO World Heritage Site called the Canadian Rocky Mountain Parks; this area is made up of several contiguous national and provincial parks straddling the Rocky Mountains that form the boundary between British Columbia and Alberta. It’s a wide swath of towering peaks, icefields, glaciers, lakes, waterfalls, limestone caves, canyons, wildlife-filled forests and geological riches. In summer this string of preserves is a hiker and paddler’s paradise; in winter it is a blissful refuge for backcountry skiers and snow-shoers. No wonder the Cree exclaimed “Yoho” in awe of the dramatic landscapes on the Rockies’ western slopes. Hike to Wapta Falls or make your way to Takakkaw Falls, one of Canada’s highest. 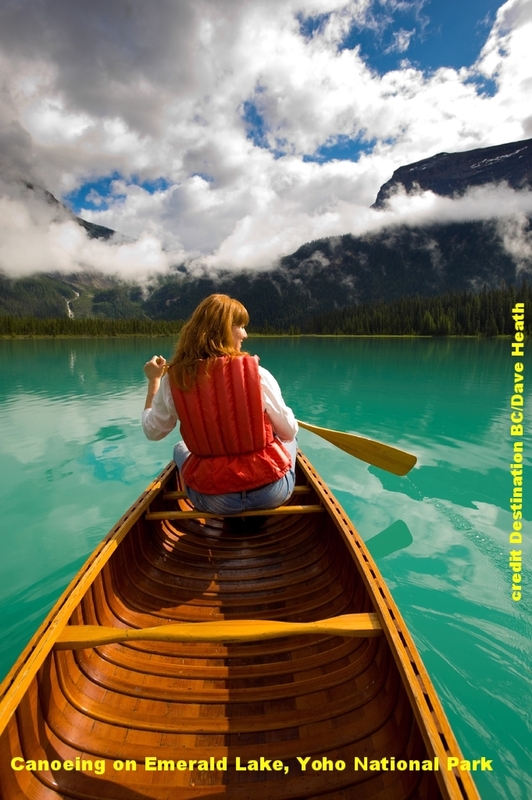 Paddle and picnic at the surreal-turquoise Emerald Lake, and gaze across at the Natural Bridge where ancient stone has been carved by the rushing waters of Kicking Horse River. And, at an elevation of 6,562-plus feet, alpine Lake O’Hara is a trekker’s playground of hanging valleys and panoramic views. Right next door, Kootenay National Park is diverse, from glacier-draped peaks to semi-arid cactus country. Watch for shaggy white mountain goats on the road-trip along the park’s 58-mile scenic Banff-Windermere Highway. It’s colorful here, from the green gem of Olive Lake near the Sinclair Pass Summit to the white dolomite walls of Marble Canyon and the rust/orange Paint Pots, mineral springs that were an important source for First Nations ochre paints. 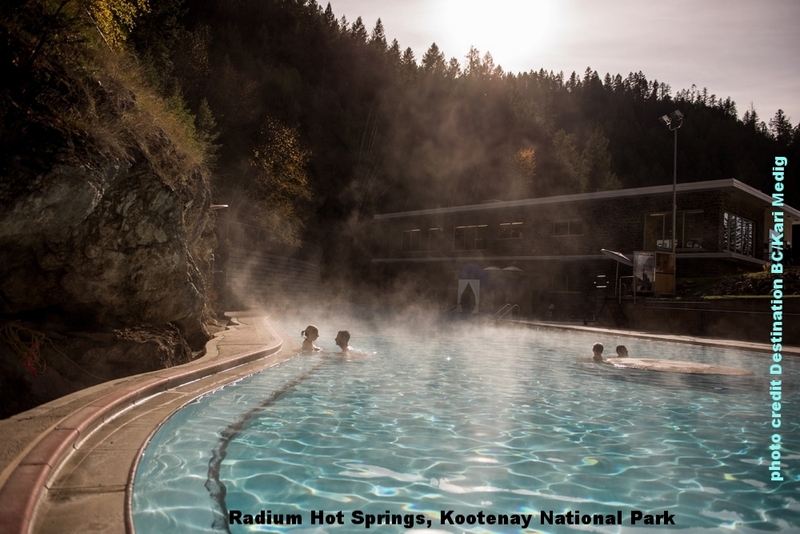 Then finish up with a soak in the soothing waters of Radium Hot Springs or Fairmont Hot Springs. 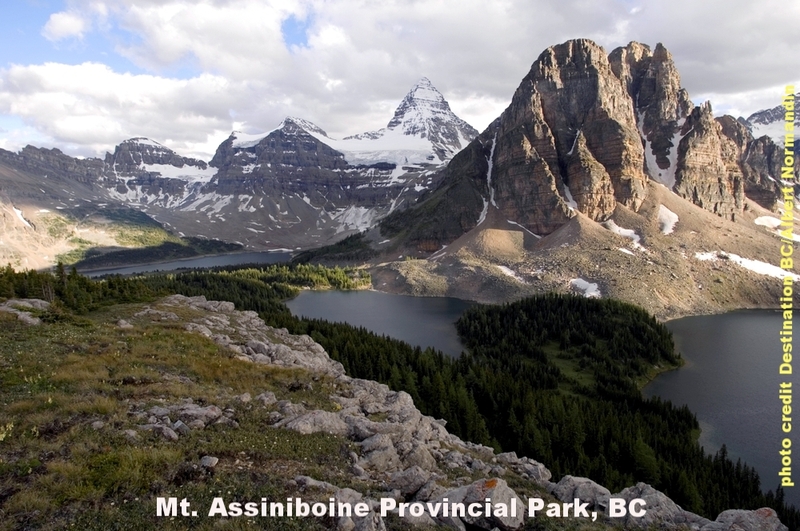 To the south, the roadless wilderness of Mount Assiniboine Provincial Park is the domain of hikers, skiers and horseback riders who explore alpine meadows beneath glistening glaciers and the impressive peak of 11,870-foot Mount Assiniboine. The 1928 log Assiniboine Lodge, the Canadian Rockies’ first ski lodge, is a charmingly rustic mountain base in summer or winter. 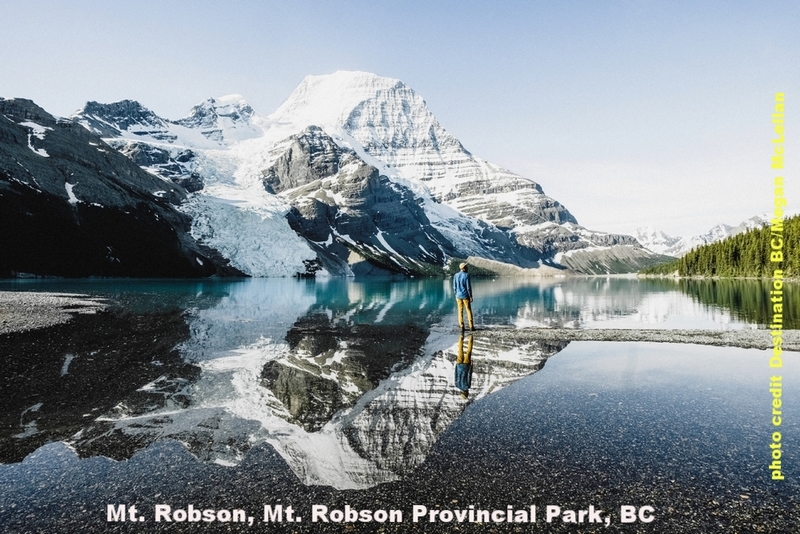 Robson Provincial Park protects another summit, the Canadian Rockies’ highest. Mount Robson towers 12,972 feet above the headwaters of the Fraser River. It’s a vast preserve accessible along the Yellowhead Highway for outdoor adventures including fishing, caving, camping and hiking in a remote wilderness rich with grizzly bears and caribou, mountain goats and big horn sheep, and moose in lowland marshes. Squeezed into BC’s northwestern corner, Tatshenshini-Alsek Provincial Park is part of another contiguous UNESCO World Heritage Site, Kluane/Wrangell-St Elias/Glacier Bay/Tatshenshini-Alsek, about 24 million acres of glacier-cloaked peaks, unbridled rivers, endangered wildlife and unique vegetation sprawling across the Alaskan and Yukon borders. Together, they make up a massive protected area that is home to the world’s biggest non-polar icefields. BC’s wildest rivers, the Alsek and Tatshenshini, churn through grand glacier-carved, U-shaped valleys, a place of staggering beauty where grizzly bears, caribou and Dall's sheep roam. These valleys are vital to the eco-system as a migration route through mountains and ice from the interior to the Pacific. It’s a dynamic landscape with ice-clad peaks like Mt. Fairweather, at 15,300 feet, the province’s tallest. This pristine wilderness has no roads, but outfitters like Canadian River Expeditions make it an accessible adventure destination, offering rafting, paddling and hiking; mountain bikers can explore challenging terrain and old mining roads. British Columbians have often fought hard to keep their natural landscapes wild. Clayoquot Sound on Vancouver Island’s west coast was the focal point of grass roots protests against old-growth forest logging which led to the establishment of the Clayoquot Sound Biosphere Reserve, a UNESCO designation of terrestrial and coastal ecosystems that promote reconciling conservation with sustainable use. It’s a lush, diverse region of alpine peaks, temperate coastal rainforest and rocky shorelines where Steller and California sea lions are common. The gateway is the seaside community of Tofino where visitors can join outfitters for whale and bear watching, sea kayaking among grey and humpback whales, dolphins and porpoises to hidden coves, hiking rainforest trails amid towering 1,000-year-old cedars, and slipping into the warm waters of Hot Springs Cove. Eager to overnight? Stay within the biosphere in luxury at the tented Clayoquot Wilderness Resort. On BC’s northern coast, steeped in misty mystery, are the remains of the 19th century Haida village of SGang Gwaay Llnagaay, a haunting site where the last carved mortuary or memorial poles still stand on a tiny island in the Haida Gwaii archipelago. Fallen, decaying longhouses lie half-buried in lush moss amid giant red cedars once used to build ocean-going canoes and trademark poles that displayed the symbols of family history and held the bones of ancestors. Every summer Haida Watchmen keep vigil over this World Heritage Site. They greet and inform visitors who arrive via Zodiac, kayak or on small luxury cruise or sailboats operated by outfitters such as Maple Leaf Adventures, about their people’s 10,000-year-old traditional relationship with the land and sea, and about the oral traditions of a thriving coastal people with a rich culture that has seen a robust resurgence in recent decades. Alaska is big, can be expensive, holds natural wonders, includes abundant wildlife and a rugged environment. "It's worth exploring," claims Alaska travel expert Scott McMurren. "But you should be prepared," McMurren said. In addition to sturdy walking shoes and layers of clothes to protect you from the unpredictable weather, McMurren suggests you do some research. There are parts of the state that are better for fishing, wildlife viewing or an uninterrupted quiet encounter with nature. If you're traveling independently take advantage of the Alaska TourSaver coupon book. As an Alaska travel expert, McMurren has spent decades checking out the state's best operators. He compiles a 2-for-1/buy-one-get-one-free coupon book featuring the companies who offer the best fishing trips, rail tours, flightseeing options and accommodations. The Alaska TourSaver book is available as a physical book or as an electronic "app" for an iPhone or iPad. There are three versions for iOS devices and one version for Android phones. Taquan Air flightseeing in Misty Fjords National Monument. Save $269. Jetboat Tour up the Stikine River with Alaska Waters in Wrangell. The Stikine River is the fastest-flowing navigable stream in North America and Jim Leslie has the right boat to show off the territory. Save $203. Whale watching in Juneau with Alaska Whale Watching. Save $159. Take a ride on the Alaska Railroad between Anchorage, Denali and Fairbanks. Save up to $479. Go fishing on a chartered deep-sea fishing boat for halibut, salmon, cod or rockfish. Save up to $355. Buy-one-get-one-free hotel accommodations in Anchorage, Palmer, Skagway, Juneau and Valdez. You can purchase the book online for $99.95. Instructions are posted on how to download the electronic "app" for smartphones. The print edition is also available at Carr's and Safeway stores throughout Alaska. You can sign up for McMurren's weekly Alaska travel newsletter, the Alaska Travelgram. It's free.